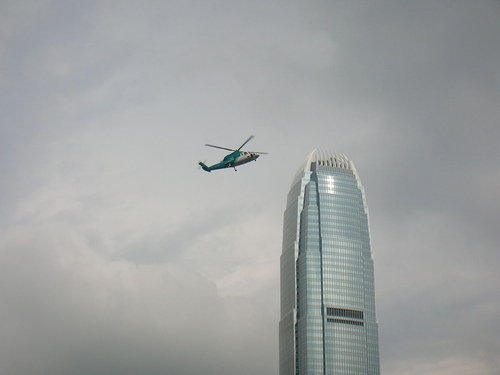 This is tower two of the International Finance Centre in Hong Kong. Doesn’t it look just like a razor? I took the photo because the helicopter scudding past it makes it look like an advert for something hi-tech, though I’m not sure what. It’s 415 metres tall, which makes it the tallest building in HK, but I can’t tell you where it ranks among the world’s tallest buildings, because it keeps changing and it depends on whether you count things like a spike on top as part of a building. Anyway, it’s tall – but you can’t go up it, which I think is a great loss. In Tokyo and New York the top floors of skyscrapers are opened up as public spaces, with viewing galleries, bars and exhibitions, which is just about the most civilised thing I can think of and I wish more places did it. But it doesn’t happen in London, and it seems it doesn’t happen in Hong Kong either. Although I think the glory of Hong Kong is in looking up at it from ground- (or sea-) level, so perhaps it’s not such a loss.